Have you been dealing with a transmission problem for some time? Are you unsure about the extent of the problem with your transmission? While transmission problems are no doubt one of the most serious issues that can affect a vehicle, they often require only minor repairs or adjustments to resolve. At AAMCO Transmission and Total Car Care of Merced CA, we take the time to thoroughly diagnose your transmission problem, and then create an effective plan for repair. During our exclusive Transmission Scan service, we will check the level and condition of your transmission fluid, transfer case, and differential fluid (where applicable). We will also take your car for a test drive in order to better understand your vehicle’s initial engagements, drive range, upshifting and downshifting timing and quality, passing gear, TCC engagement, and 4x4 performance. We’ll also test your vehicle in neutral, park-hold, and reverse and feel for vibrations and listen for any strange sounds. 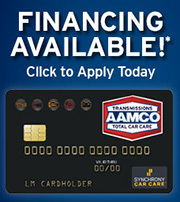 Once this thorough evaluation is complete, your AAMCO technician will recommend the repairs your transmission needs. However, if this initial evaluation doesn’t turn up the cause of your transmission problems, we will use our state-of-the-art diagnostic technology and equipment to pinpoint the problem. New vehicles are especially dependent on their computer systems, which is why advanced computer and internal diagnostics are essential for determining the cause of a problem. At AAMCO, our skilled technicians can isolate the problem so you’re not paying for unnecessary repairs. AAMCO Computer Diagnostic Service can determine if an electrical component is affecting your transmission’s shifting ability or overall performance. Using a computer system scanner, your technician will be able to retrieve potential trouble codes, check all critical systems, and compare your system data with the data in our technical database. Using our AAMCO Kwiktes PlusBox, your AAMCO technician can find out whether the problem is in your transmission or elsewhere. Finally, your technician will recommend specific repairs and replacements, as needed. It is because of this thorough approach using state-of-the-art diagnostics that we can pinpoint the exact cause of your transmission problem and repair only that problem, saving you time and money. In fact, more than half the vehicles we service only require a minor repair. Other repair shops can’t say the same. Come to AAMCO Transmissions and Car Care of Merced CA to expect honest, thorough, and skilled service every time.